Aliu Sanni, MD, Sebastian Perez, MPH, Rachel Medbery, MD, Hernan Urrego, MD, Craig McCready, MD, Juan Toro, MD, Ankit Patel, MD, Arvin Singh, MD, Jahnavi Srinivasan, MD, Barbara Pettitt, MD, Edward Lin, DO, John Sweeney, MD, Scott Davis, MD. Department of General & GI Surgery, Emory University Hospital. Introduction: Bariatric surgery results in long-term weight loss and significant morbidity reduction. Morbidity and mortality following bariatric surgery remains low and acceptable. BMI > 50 kg/m and age >45yrs have been implicated as independent predictors associated with significantly increased mortality. This study looks to define the real trend of morbidity and mortality as it relates to increasing age and BMi in patients undergoing bariatric surgery. Methods: We queried the ACS/NSQIP 2010-2011 Public Use File for patients who underwent elective laparoscopic adjustable banding, sleeve gastrectomy and gastric bypass. Total morbidity and 30-day mortality were evaluated. 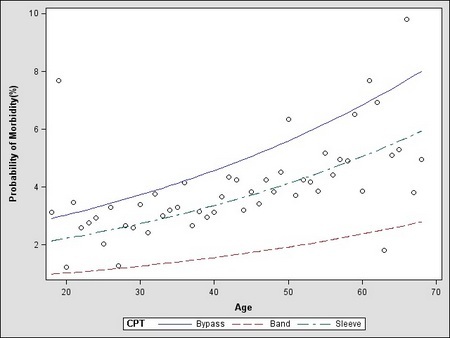 The average BMI and age were compared for mortality using sample t-tests. 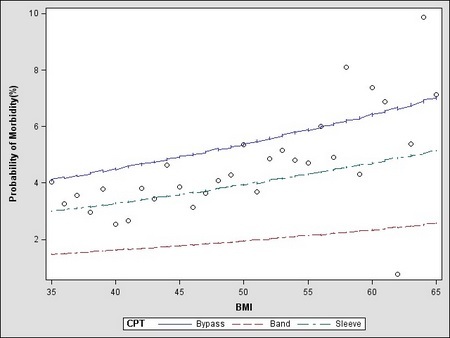 Logistic regression models were created to estimate the effect increasing age and BMI on morbidity for these bariatric procedures. Results: A total of 20308 laparoscopic bariatric procedures were reviewed (11,617 gastric bypasses, 3,069 sleeve gastrectomy and 5,622 gastric bandings).There were 22 mortalities (0.11%) and 801 patients with at least one reported complication (3.84%).The mean age (52yr vs. 44yrs: p<0.05) and BMI (50 vs. 46: p<0.05) were significantly higher in patients with mortality. The odds of postoperative complications increased by 2% with each additional year of age (OR 1.02, 95%CI 1.02-1.03) and every point increase in BMI (OR=1.02, 95% CI 1.01 – 1.03) – see Figures 1 &2.Postoperative complications were three times more likely after laparoscopic gastric bypasses (OR 2.87, 95%CI 2.31-3.57) and two times more likely after sleeve gastrectomy (OR 2.06, 95%CI 1.57-2.72) when compared to patients undergoing laparoscopic gastric banding. Conclusion: 30-day morbidity and mortality rates for bariatric surgery are low. Morbidity and mortality increases on a predictable trend with increasing age and BMI. . There is increased risk of morbidity for stapling procedures when compared to gastric banding, but this must be considered in context of surgical efficacy when choosing a bariatric procedure. These data can be used in preoperative counseling and evaluation of surgical candidacy of bariatric surgical patients.